The places we live define us as much as we, the residents, define them. Some of us deliberately choose these spots we call home, while others, for myriad reasons, have little choice. Some of us seek out urban locales for convenient access to our jobs, others to find a calm oasis in the midst of a bustling city. Some are there for affordability, some for the opposite — exclusivity — while others want to be surrounded by the like-minded views of others already there. Yet no matter what brings us into our respective neighborhoods, the distinctive geography, history, economics and demographics of our urban boundaries impact us in ways far beyond our address or zip code. For this project, a team of 11 writers set out to profile a diverse, representative swath of the region's urban neighborhoods, spanning the city of Spokane and two of our North Idaho neighbors, Coeur d'Alene and Moscow. Readers may notice their own neighborhoods missing from this section, and to that end, we emphasize that it was no easy task to choose which to include, and which to omit. Hillyard, for example, is notably absent here; however, we published an in-depth section on that area a few months ago, which you can find at Inlander.com/hillyard. We also previously covered a good portion of Spokane Valley in our mile-by-mile look at Sprague Avenue; find those stories at Inlander.com/Sprague. 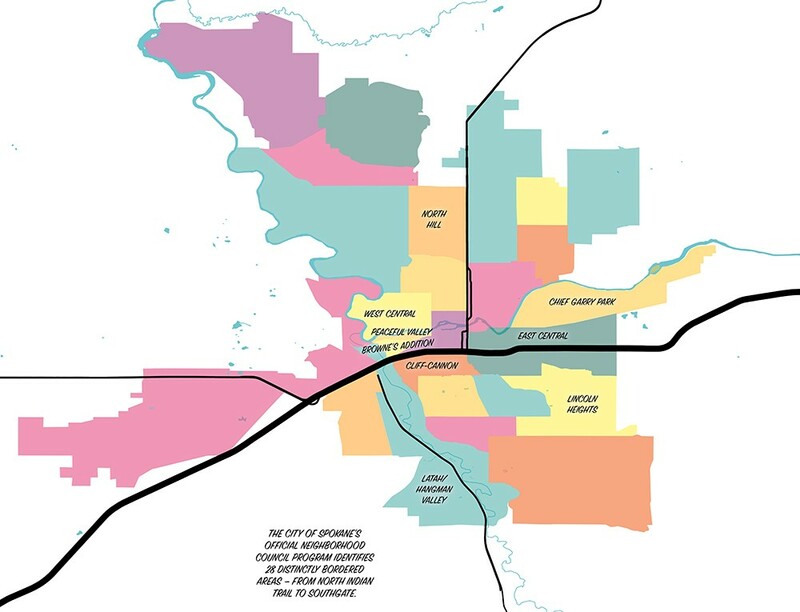 With the goal to show a broad range of the local history, demographics and geography of the neighborhoods that define our home — places we all recognize, even if we don't live within their bounds — we believe the following pages collectively identify the many reasons we all love living here, the greater regional neighborhood of the Inland Northwest.